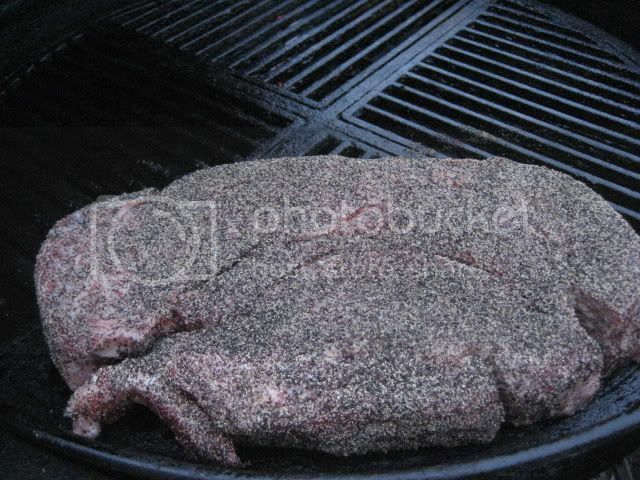 Heavily season Chuck Roast with Kosher Salt and Fresh black pepper and cook indirect in the 245º-260º range, you can add smoke wood if you prefer, I did not. Cook until the internal temperature reaches 165º. Once the roast hits 165º, combine remaining ingredients into a pan. Then place the roast into the pan directly on top and cover tightly with foil. 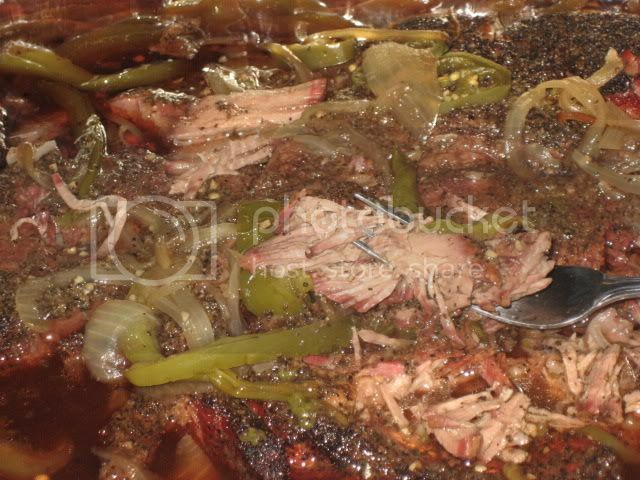 Continue to cook roast in a smoker or oven at 350º for 2.5-3 hours or until it is fork tender. 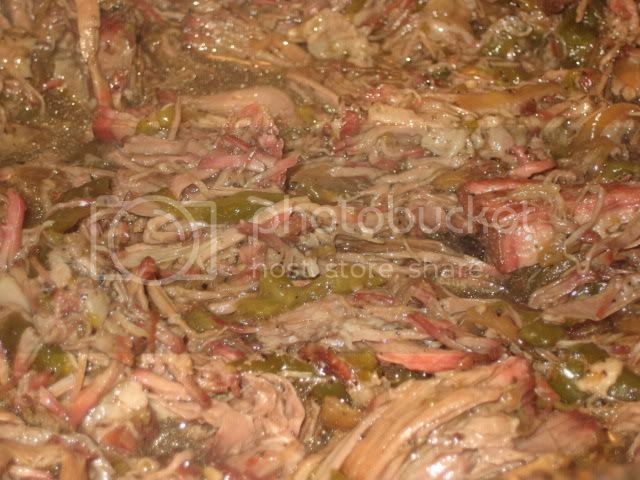 Once the meat is tender, shred all of the meat and continue to cook uncovered until the liquid is reduced by half. 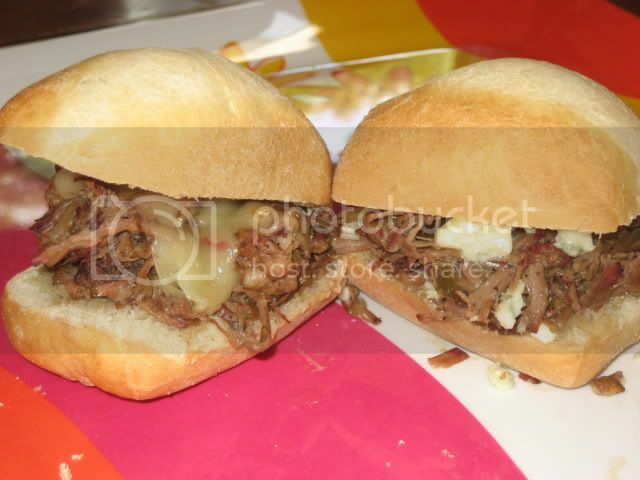 Serve meat on hard rolls with or without cheese. We used pepper jack on some and gorgonzola on some and liked both, but provolone or swiss, etc., would work as well. Horseradish would be another good condiment. I did this method today...and it is absolutely awesome! 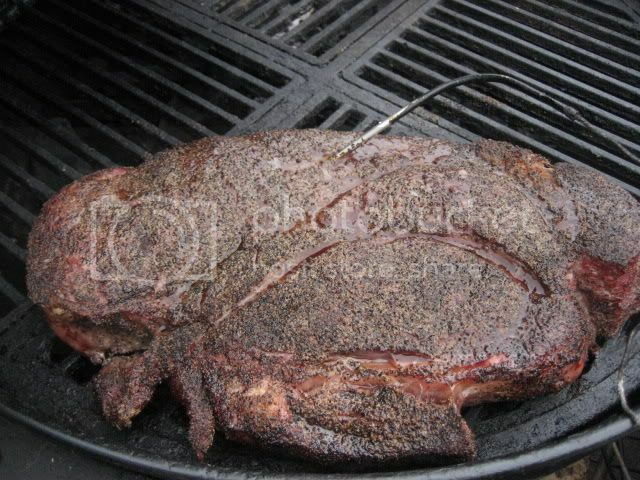 Only thing I did differently, being deep in South Texas, is that I smoked the 4 lb hunk o'meat with a mix of pecan and oak for 3 hours, at that point the internal temp hit 165f and it went into the roasting pan in a 325f oven for a full 3 hours. I did not need to "reduce the juice" at that point, I just let it rest 20 minutes then I shredded away. It was a hit! Everyone LOVED it. Thanks for this killer recipe. I made this for a big family dinner this weekend, just with 1 jalapeno though and using oak to smoke for 3 hours before braising. It was fantastic, the whole family really enjoyed it. Thanks for posting a great recipe. I made this last weekend and while it came out great, the one modification I would do is use 3 Jalapenos, cored and seeded instead of 3 with seeds and all. It didn't exactly send me sprinting to the fridge for a glass of milk, but there was some serious heat and my wife couldn't eat it. Or maybe replace the jalapenos with 2 cored/seeded poblano peppers. Just saw this on the Brethren site Larry. This just may be cookin' this one up in the yard this weekend. Thank you very much Joe!! Let me know how you like it!! Hi Larry. Question for you. I'm planning on making this for a large group of people this weekend. 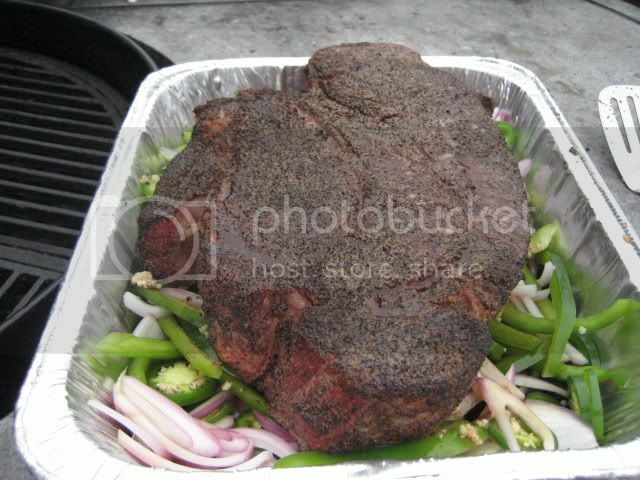 I have a 18.5 WSM and was wondering is it better to make one 10lber., or go with 2 5lbers.? Would cooking times be affected? I would go with 2 smaller ones because you will have more surface area for smoke and seasoning and it will give you smaller strands of meat so you will only need to shred it versus shredding and cutting. Hope you enjoy and remember chuck roasts are stubborn and it's not done until the meat twists like spaghetti!! Thanks! Larry, I know this is way beyond when I asked you this question, but I thought I'd let you know that the PSB was fantastic. Everybody loved it! In fact I'm firing up the smoker again tomorrow for my second run at it. Thanks for your timely reply to my first question, I was kind of stressing about smoking a large chuck roast. Really glad it turned out great for you Dennis! How did you end up doing it? 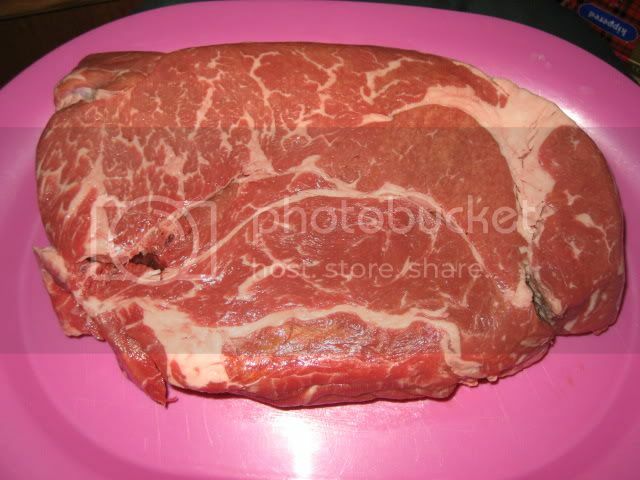 As one big roast or cut in half? Hope the second one turns out even better! Let me know please! Larry, I smoked 2-5lbers. I used oak, and followed the recipe exactly. I did hit a stall at about 145 degrees, for about 2 hrs,but was in no hurry. Right now I have 2- 2.5 lbers. in the WSM. Using hickory, as I am also smoking a chicken. The beef I am making for our family vacation the first week of August. I will vacuum seal and freeze until then. I will sneak a few bites tho. I will let you know how it goes over when we return. Larry, I'm using a WSM and have a smaller roast (2lbs). Obviously I'll half the ingredients and monitor temp for timing. Need I adjust the temp window? Do you mean the temperature for the meat? If so no, the smaller pieces are just as stubborn as the big ones! When you can insert a fork and twist it like spaghetti, it's done! Hope this helps! Actually meant the smoker temp. Sounds like it's about the same. Thanks Larry! Doing this for the first time today, fingers crossed!! Hope you enjoy Phil! Let me know how you like it! made this yesterday and i was a great succes, maybe a little less heat for the wife, but overall very good. Your's turned out perfect!! Sorry it was a little hot for your wife! Glad you enjoyed it!! Can you recommend something to use instead of beer in the recipe? I'm cooking for someone allergic to beer. Please advise. Thanks. Any cola (coke, pepsi, etc.) or leftover coffee will work perfectly. Trust me on this....it will have a minimal (if at all) flavor of the coffee or cola taste in the end. Hope this helps. Let me know how it turns out! Sounds awesome Steve! Looking forward to the pic's! This is a very simple and good recipe. Thank you Rachel, I'm glad you liked it! Absolutely fantastic! 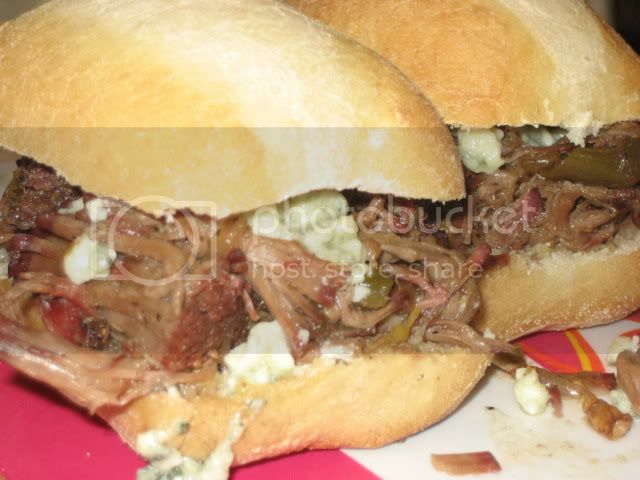 I made this on my WSM, shredded the beef and served on rolls with a horseradish mayo. Awesome eats. Thanks for posting! We made this recipe for Christmas, and IT IS AMAZING!! Thank you so much! Happy holidays! Thank you very much!! Really glad you gave it a try and enjoyed it!! Happy New Year! How much does one recipe feed? About how long is the total process usually? Thank you! Also, what does "probe like butter" mean exactly...same probe as thermometer or different one? Thank you! Ok, I did the recipe for our family gathering today on my new Big Green Egg, feeding 13 of us. I did 16lbs of chuck in 3 2-packs from Costco. Having the comment section really helped fill out the missing details of the recipe. I am very glad that I only used 1 large jalepeno for each of the 4 pans of vegetables, because with all of the pepper in the rub, garlic and that one jalepeno, it was plenty hot! I did make a pan with no jalepeno, for those who don't like it. I used this recipe, https://www.afamilyfeast.com/creamy-horseradish-sauce/ for a creamy horseradish sauce as a condiment. Everyone loved it, but was glad I didn't put all of the jalepenos in it. We have lots of leftovers, so maybe an estimate of how much this serves would be good. Also, waiting until the meat was very loose, not the temperature only is the way to go. Thank you for a great recipe!